Being a Japanese brand, Hitachi produces good quality products with improved technology in its refrigerators. Hitachi is a big name in Air Conditioners, however, its market share is less in refrigerators. Just like its name which means “sunrise”, it’s just the sunrise of Hitachi in India; it has a good long way to go before it establishes a dominant position like Samsung or LG. But they have the “Japanese” build quality and really good technology. Innovation and development of the energy efficient appliances are observed to be the key theme of Hitachi refrigerators. New series of Hitachi’s 2017 refrigerators utilize advanced scientific designs to manufacture refrigerators which prevent the loss of amino acids and other essential vitamins in the food. Hitachi presently provides double door, French door, and six door refrigerators in India. Generally, conventional refrigerators come with a single fan which takes the burden of cooling both—refrigerator and freezer. But most of the new Hitachi’s refrigerators come with a Dual Fan Air Jet Flow technology which enables independent cooling of the refrigerator and freezer compartments. Using two separate fans, it effectively circulates the cold air throughout the refrigerator. A very few brands like LG and Samsung have a similar technology in their convertible refrigerators. Additionally, few premium models also come with Front Jet Freezing technology that provides cooling air from both back and the front side of the compartment. This provides much more uniform cooling inside the refrigerator to keep the food fresh for longer. Thanks to these technologies premium Hitachi refrigerators are capable of continually cooling the refrigerator even in the ambient temperature of 60°C. When the meat and other such food item are kept in the ordinary freezer, water inside the cells freezes into large ice crystals. These large crystals gradually become so big that they destroy surrounding cell walls which result in dripping of the frozen food. This is the main reason behind the loss of flavor and taste. 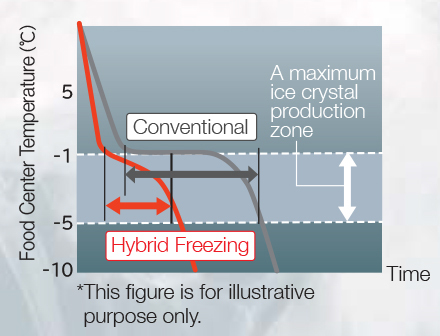 Hitachi refrigerator comes with Hybrid Freezing technology to tackle this problem. An especially designed aluminum plate is used which makes the food rapidly pass through the temperature zone of -1°C and -5°C. This keeps the size of ice crystals to a minimum, to curtail the wall damage owing to the increased size. Vegetable mode: For storing and organizing fruits and vegetables which are susceptible to damage due to heat. Chiller mode: For storing meat, fish and dairy products. 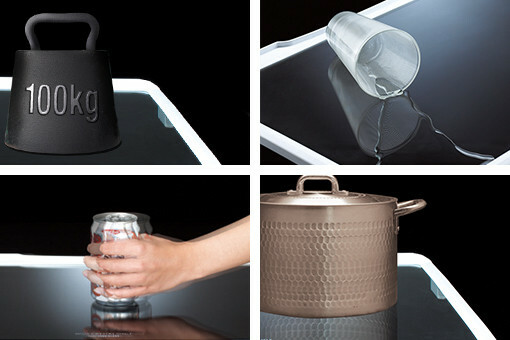 It rapidly thaws the frozen meal and quickly cools the drinks. This convertible crisper also comes with aero care and moisture guard technology. Aero care technology maintains a high concentration of carbon dioxide using a platinum catalyst that helps to keep vegetables fresh for longer. Moisture guard on top ensures indirect cooling to maintain the right proportion of moisture inside the compartment. New bottom freezer models from Hitachi comes with open top of the freezer compartment so it is easier to reach directly. 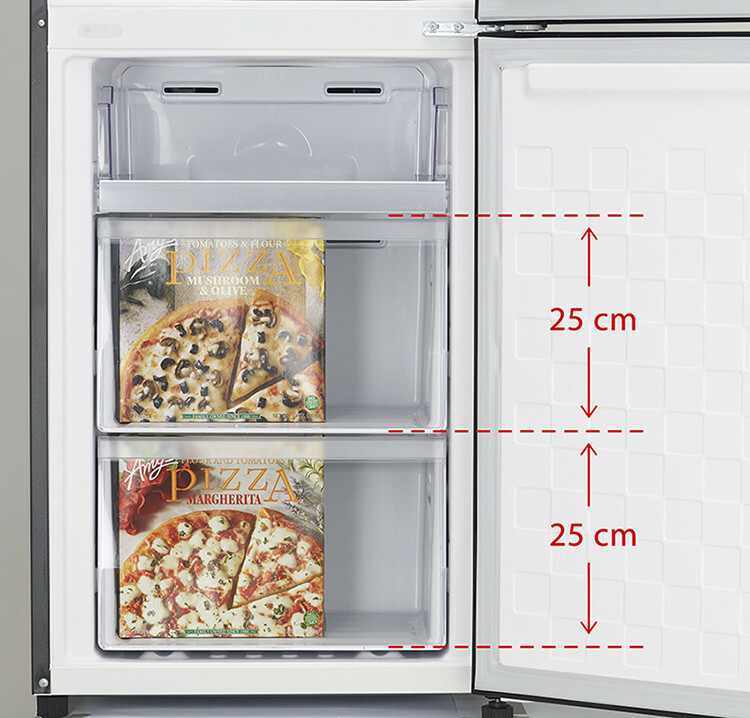 Sometimes it becomes tricky and often impossible to store large size pizza or tall height bottle. Hitachi’s new double door model comes with deep and large case capable of storing food big in size. Then there is slide shelf that makes it convenient to see and reach item by simply sliding the tray out. Adjustable door pockets (where bottles are stored) allow the user to change the pocket layout in accordance with their need. There is also a wavy-shaped stylish shelf that holds the bottles at the optimum angle for storing wines and other 1.5L large bottles. Thus, Hitachi’s tempered glass shelves provide a complete protection from vagaries of load and temperature. A gasket inside the refrigerator is a flexible elastic strip attached to the outer edge of a refrigerator. Modern Hitachi refrigerators are designed with an air-tight structure which insulates the cool air inside the appliance from the warm external environment. The best part is, it is removable. So, users can easily remove the gasket for cleaning purpose. Thanks to Hitachi’s moldproofing treatment, the gasket can be clean very easily. Modern Hitachi refrigerators come with a cutting-edge nano filter technology. Incredibly small size (about 5 nm) particles are packed together to form this unique filter which deodorizes the air and decimates the bacteria inside the refrigerator. This powerful anti-bacterial filter sifts odd and filthy odor emitted from the rotten food. Thus, it makes sure each compartment is fully circulated with clean and hygienic air. Energy saving is one of the prime focus for Hitachi. That is the very reason that most of the 2017 series of refrigerators come with eco-friendly R600a refrigerant which is CFC & HFC free—two prominent culprits of ozone layer depletion. R600a is known to have a low environmental impact and an excellent thermodynamic performance. Another good thing is that it is non-toxic with zero ODP (Ozone Depletion Potential) and minimal GWP (Global Warming Potential). This refrigerant is around 99.5% pure with minimal levels of critical impurities like unsaturated hydrocarbons making it ideal for all types of refrigerators. Hitachi modern refrigerators are equipped with energy-efficient LED lighting which is not only slimmer but also softer. This LED lighting system emits much lesser heat than the ordinary bulbs. This implies that the stored food remains much more immune to temperature swing owing to the lighting arrangement. Besides consuming lesser power, they are much more durable. Premium French door and multi-door refrigerators from Hitachi come with a touchscreen controller mounted on the front. They provide all the cooling information and controls at the fingertip of the user. From an energy saving perspective, it’s not a very good idea to keep opening the door of refrigerator intermittently to sniff what’s inside. Because every time you open your fridge, it needs to rework to balance the requisite temperature inside the refrigerator. But with these modern Hitachi refrigerators powered with a touchscreen LED display outside, the user can know what’s happening inside the refrigerator without needing to open the door every time. There’s nothing easier than pressing a lever to fill the glass with chilled water. 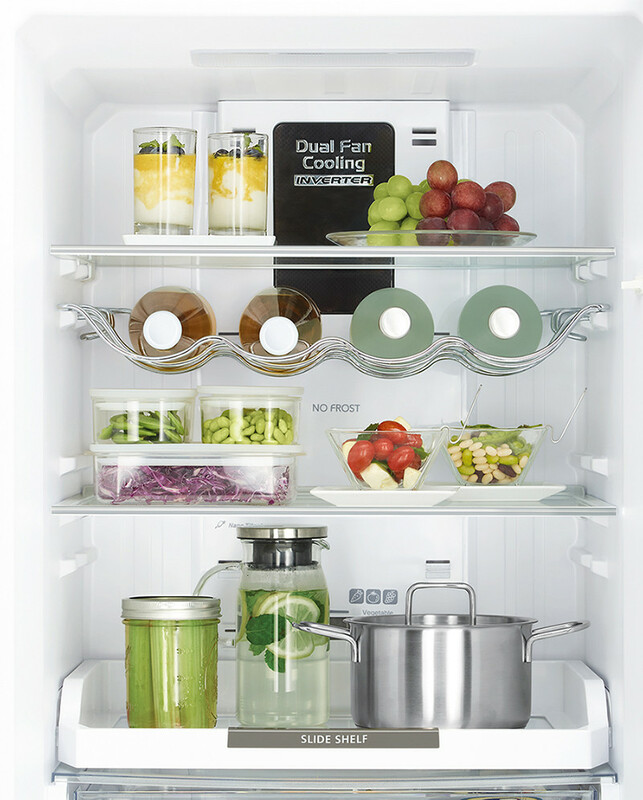 Hitachi’s high-end multi-door refrigerators offer this ease. They come with an inline automatic dispenser giving out water just at the press of the lever. Compressors in the lower-end/primitive refrigerators come with single speed motor. They are either “on” or “off” based on the temperature in the refrigerator. Such compressors are designed to work incessantly at the peak load conditions (for high temperatures in summers), which means that they run at peak load even in winters when the cooling requirement is less. This is where established brands like Hitachi manifest smartness. 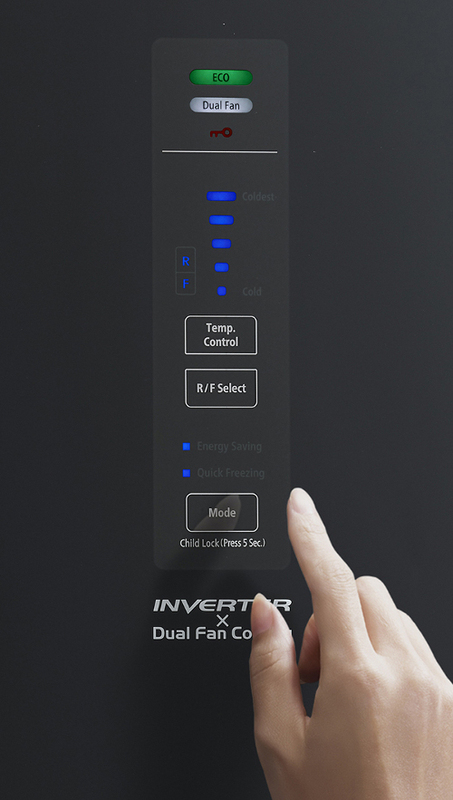 New Hitachi refrigerators come with inverter control assisted with eco-thermal sensors that continuously run at a variable speed based on the input from the aforementioned sensor. Working of the compressor with inverter technology is analogous to the car accelerator. When the speed required is more, the acceleration is more, and when it is less, and then the acceleration is less. This makes sure that during the summer season when the cooling load is more, the compressor works at the peak capacity taking more electricity. But during winters when the cooling load is less, the compressor runs at the lower speed thereby consuming less electricity. Even during summers, the night temperature is less than the day temperature. Thus, electricity is saved even during the late evenings when compressor can run at a lesser speed. The inverter control technology from Hitachi not only results in cost savings but also emits less noise and mitigates the carbon footprint. Another good thing about latest Hitachi refrigerators is that they can work without dedicated stabilizer. These refrigerators can operate steadily devoid of damages due to voltage fluctuation. Also, if the voltage fluctuation exceeds the preset permissible limits, the power supply is automatically switched off, so it does not cause any harm to the refrigerator. Hitachi refrigerators are designed to work stabilizer in the voltage range of 130V to 300V. One of the important strengths of Hitachi refrigerators is powerful cooling which can work even at high ambient temperatures. This would prove valuable in hot and dry areas where temperature soars during the scorching summers. Energy efficiency is another important good takeaway of Hitachi refrigerators. Usage of eco-friendly R600a refrigerant and energy-efficient LEDs in the new line up is an example of that. One of the main shortcoming with Hitachi is they don’t manufacture single door refrigerators. With a big chunk of people opting for single door refrigerator in India, this is a big miss. Another deterrent when considering Hitachi is its low penetration in the Indian market. There are just a few models listed on e-commerce which makes the choice narrower for online buyer. Tempered glass shelves used in Hitachi refrigerators are useful but then not as strong as the ones offered in Samsung or LG refrigerators. This might sound an overstatement, but Hitachi is a pretty unsung brand of refrigerator. Hitachi is a part of reputed Hitachi Group which makes into the elite Fortune 500 list. One of the important reason for low acceptance of Hitachi brand is the unavailability of direct cool refrigerators. The double door and French door models from Hitachi does a pretty decent job though. Utilization of dual fan ensures uniform and through cooling in fridge and freezer compartment while hybrid cooling ensures faster cooling to protect meat products from dripping. New models offer lots of customization option for arranging shelves and storing bottles in bottle pockets and wine racks. Eco-thermal sensors guiding the microcomputer based inverter controller ensures optimal cooling and energy saving. So, if you are looking for a double door or multi-door refrigerator and looking for a premium brand you can consider Hitachi refrigerators.